Hi all, was wondering if the rear springs from a KZH106 (Super Custom 1993.08 and forward) would work in the LH107 model (Super Custom 1991-1993.08). 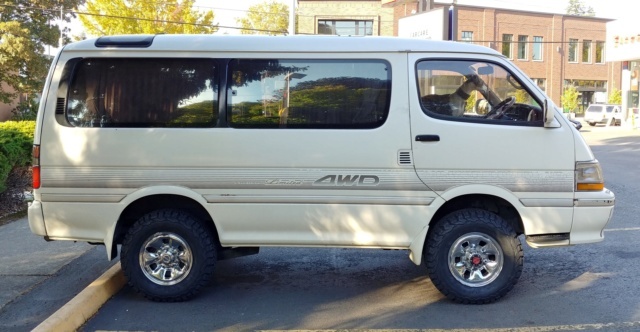 I have a 1991 Super Custom 4WD that I would like to put some lift springs into, and I have seen listings on the Buyee auction site in Japan for the KZH106. I figured since they were adjacent models, there would be a good chance that the springs would be the same or similar enough to swap between models. Anyone know for certain? I have inquired with Cobra Springs in Australia about their springs (CTRR-271), but not sure if they ship to the USA. Thanks! I checked before posting and they are different part numbers, wasn't sure if that was due to them being for different models, or perhaps the spring rate was slightly different. I think the curb weights are slightly different between them due to the 1KZ-TE engine and the AWD components. I checked again and it's interesting that the INSULATOR, REAR COIL SPRING, UPPER and the lower parts are compatible between the KZH106 and LH107. If those parts are the same then you'd think the diameter and coil thickness would be nearly identical. Just went back again and even the LH107G (Super Custom 4wd) and LH107W (Super Custom Limited 4wd) have different part numbers. The parts code is the same for all three models, but the number after the dash is different. I suppose they are all tuned for different weights and ride heights. 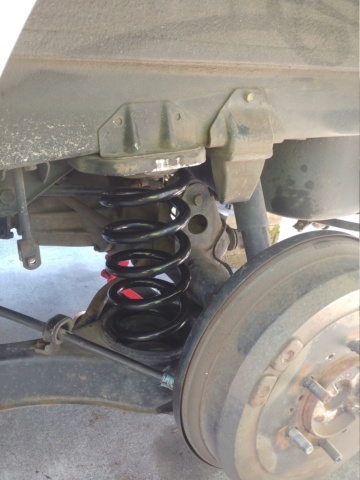 I would have thought that 4wd springs would do for 4wd and 2wd for 2wd without too much drop or raise, but I wouldn't mix springs between 2wd and 4wd. On the back of the 2WD the dishes are do deep that you can raise or lower the van a bit just by padding up or cutting the rubber 'insulator' (you can fit rubber discs in - it's like a giant saucepan inside the 2WD ones. IIRC the spring centre is about 80% of the way along the trailing arm from the front pivot to the back pivot (you should check this for yours), so a 25mm rise only needs a 25 x 0.8 = 20mm spring rise is needed. Look at how much of the spring goes into the trailing arm and consider adding some rubber disks underneath the old 'indulators' if you are only after a moderate lift. I put a 10mm rubber disk on mine to correct an over-zealous lowering on mine, worked well. The real expert on lifting 4wd is Hiace4wd but he may have leaf springs. I'm thinking you're onto something with the 4wd=4wd comment. I found some photos of the OEM springs for the LH107 and KZH106, and, assuming the diameters are the same, they look identical. 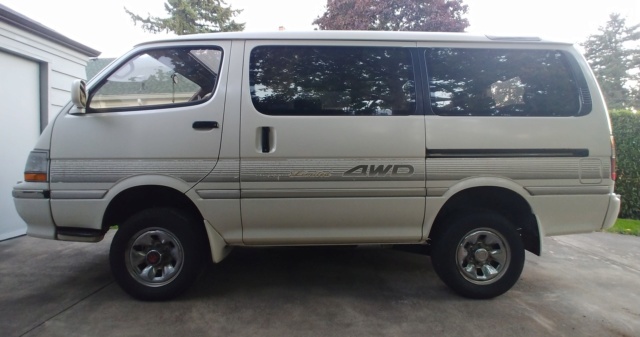 I can't imagine the spring rate or ride height is all that different considering what little changes if any took place in the rear half of the van between those two models. I pulled the trigger on a set last night and will reply back once I've received them and done the swap. I also ordered some new rubber bits for the lower shock mount since they are looking worn out. Fingers crossed and thanks for your insight! I'm having some difficulty removing the lower shock nut, is that a necessary step for removing the rear springs? It's part of the service manual's steps for spring removal, but the bottom nut is recessed a bit in the metal washer and it's hard to get enough purchase to turn it without risking rounding it off. 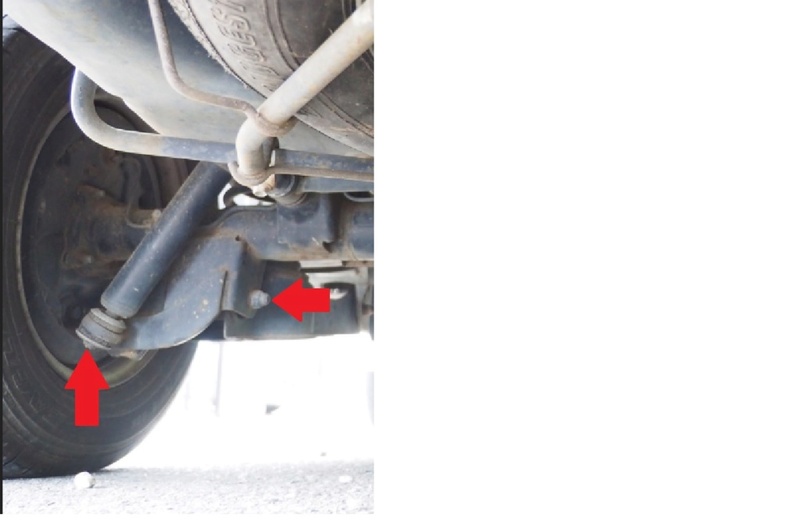 Since the shock mount is attached to the axle, it looks like you could just use a spring compressor and then remove the 22mm bolt that goes through the rear of the trailing arm and swing the arm down. Has anyone done this? My concern here is the condition of the bushing the 22mm bolt goes through, has anyone replaced one of these and what is involved in that process (e.g. removal issues, pressing out sleeves, etc.)? I didn't take the shocks off, I took the trailing arms off instead. It's easiest with a ramp and a bridge jack with shortened springs but with compressors to stop the springs fully expanding it's possible I guess. The key is to avoid a horrible accident IMO as the springs have lots of energy and make the bolts stiff to slide out. I ended up taking the smaller forward bolts out first and replacing them with big PH#3 screwdrivers to allow a bit of movement in the arm and to be able to lever the arm forward and back, then the bigger bolts next to the spring and jack lowering it down. I suspended the van on the rear chassis rails on axle stands at the end of the ramp BTW so the back wheels were a little off the deck. BTW you can also undo the shocks from inside the van at the top, under the carpet between the wheel arches there are plastic covers that reveal the bolts for the tops - possibly in better condition that the lower bolts. Were you able to re-mount the arm using the existing bushings? I have a pair on order just in case the ones on the van are trashed. But with only 91k kms I'm hoping they are still in good shape. The service manual states that the rear seat needs to be removed to access the top shock mount, have you accessed these before and did you have to remove the seat? Leaving the shock out of the picture for the moment, my plan would be to compress the spring until all the load is relieved and I can move the spring freely. At that point nearly all pressure (besides the arm's weight) should be off the rearward arm bolt and I can remove it, lower the arm, then reverse the process. I'll be counting the visible threads protruding past the arm bolt's nut to make sure I re-tighten to the same amount. Anything I'm missing or have wrong? My bushings were pressed into the arms and were fine after 190k/km. Just slide the big rear seat forward to expose the wheel arches, no need to remove. Remove the plastic strip right at the back to release the carpet and roll/peel it forward toward the cab. The spring buckets are deep, you'll not compress the springs that much I think, best put the compressors on when the springs are loaded by the van and then unload and unbolt IMO. 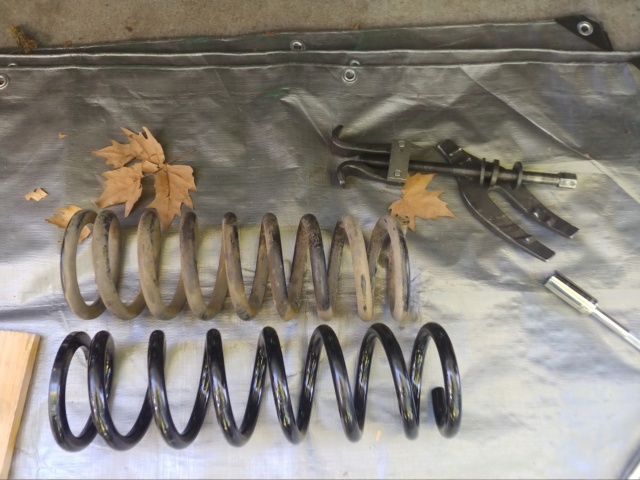 Don't rely on spring compressors exerting that much force, they are awkward and best used just to hold stuff still, use Moly grease on the threads to make them work. Be prepared for the weight of items, stuff not quite lining up and the spring force to make it all a bit stiff and difficult, maybe it's not such a bad idea to release the shocks, but the axle is also held in with a few other bits IIRC and there are brake lines and the brake compensator to be careful of. When re-tightening the trailing arm bolts I used 100 NM as that's about what wheel bolts go to and they are about the same size. Thanks for all the advice on this, it's greatly appreciated! When I attempted this on Tuesday, I had the van on stands at the rear, and then jacked up the axle until just before the stands started to creak. I then put the compressor on and was able to get the spring compressed to the point that it was no longer exerting any force on its seats and had about an inch of vertical play. Not nearly enough to get it out of the bucket, but if I can disconnect and lower the arm several more inches, I think I could get the spring out. How far will the arm swing down after removing the rearward arm bolt? How far will the arm swing down after removing the rearward arm bolt? It will hit the ground or whatever is there, there's nothing restraining the arm once you unbolt either end. Of course you'll not be able to slide the bolt out it it's not restrained by something, in my case I used a jack and lowered it down to some wood so I could remove the jack and lower it the rest of the way. If there's not much life left in the spring a wooden 2x4" may be enough to move it around, it's not infinitely strong and as you take the energy out of the spring it's easier and easier to work with. Also the spring only has to come out, it may clear the top mount first. Careful the compressors don't slip, personally I hate them. BTW bear in mind that the axle itself is pretty heavy, I left the wheels on when I did it so the axle couldn't really go anywhere. Once the arm was free I found the axle wanted to move slightly to the rear of the van, to line up the holes again I put in the rearmost arm bolt in first, then used a large carpenters trigger closing G clamp to pull the arm toward the front mount so the front pivot bolt could line up to go back in. Note that the clamp is also useful to get the bolts back in (and also to push brake calipers back in - but that's a different job). Also note that if the axle moves too far the prop-shaft may fall out. I was able to get the job done over the weekend. I wasn't able to get the arm bolt's nut to break free, so I ended up undoing the top shock mounts like you mentioned. I had to disconnect the rear stabilizer to get a little more axle drop, the limiting factor then became the brake line coming from the body to the axle, so had to be very careful there. But it gave me just enough room to compress the springs to remove and install. 26 turns on the torsion bar adjusting nuts and she is at a 1" rake. As expected, the ride in the front is a fair bit stiffer now, and I might ease back a few turns after trialing it for a couple weeks once the new all-terrain tires are on, but it's not bad as-is, and better than how the van was porpoising over speed humps when the TEMS was on the soft setting! So, in the end, it is possible to swap in lift springs for a KZH106G 4WD into a LH107 4WD. Thanks again GPW for your advice on this one! Looks good, glad it all came together and like the photos! Just wanted to post a photo of the finished project after mounting a set of BFG T/A K02 LT235/75R15 tires. I get a little bit of rub near full lock, but I haven't investigated where it's happening. Honestly I can live with it as the turning radius is so small. Thankfully I didn't have to trim any metal. My tires should be something like 28.9" x 9.3" based on an online tire size calculator.